Why is it so hard to prove that e+pi or e*pi is irrational/rational? The reason why it is so hard to prove is actually very easy to answer. These constants, identities, and variations being referred to in this post, and others like it, all lay embedded in a far deeper substrate than current mathematics has yet explored. Mathematics has been, and always shall be my ‘first love’, and it has provided for me all of these years. I am not criticising mathematics in any way. It is my firm belief that mathematics will overcome this current situation and eventually be quite able to examine these kinds of questions in a much more expansive and deeper way. We need to extend our examination of mathematical knowledge, both in depth and in scope, out farther and in deeper than numbers (sets and categories as well – even more below) have yet done. I’ll introduce you to a pattern you may have already noticed in the current stage of our mathematical endeavour. We all know there are numbers which lay outside of Q which we call Irrational numbers. There are also numbers which lay outside of R which we call Imaginary numbers. They have both been found, because the domain of questioning exceeded the range of answers being sought within the properties each of those numbers. This pattern continues in other ways, as well. This pattern continues in other ways: Holors, for example, which extend and include mathematical entities such as Complex numbers, scalars, vectors, matrices, tensors, Quaternions, and other hypercomplex numbers, yet are still capable of providing a different algebra which is consistent with real algebra. The framing of our answers to mathematical questions is also evolving. Logic was, for example, limited to quite sophisticated methods that all were restricted to a boolean context. Then we found other questions which led to boundary, multi-valued, fuzzy, and fractal logics, among a few others I haven’t mentioned yet. Even our validity claims are evolving. 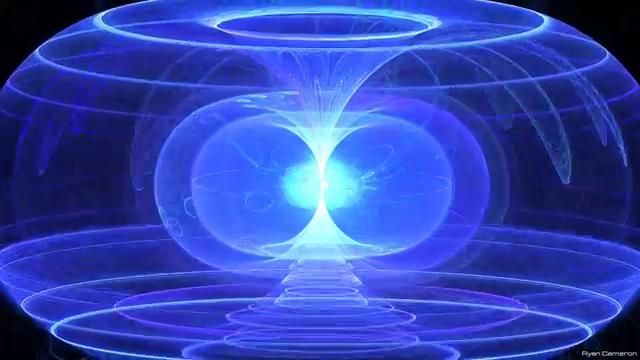 We are beginning to ask questions which require answers which transcend relationship properties such as causality, equivalence, and inference in all of their forms. Even the idea of a binary relationship is being transcended into finitary versions (which I use in my work). There are many more of these various patterns which I may write about in the future. They all have at least one thing in common: each time we extend our reach in terms of scope or depth, we find new ways of seeing things which we saw before and/or see new things which were before not seen. There are many ‘voices’ in this ‘mathematical fugue’ which ‘weaves’ everything together: they are the constants, variations, identities, and the relationships they share with each other. The constants e, π, i, ϕ, c, g, h all denote or involve ‘special’ relationships of some kind. Special in the sense that they are completely unique. e is the identity of change (some would say proportion, but that’s not entirely correct). These relationships actually transcend mathematics. Mathematics ‘consumes’ their utility (making use of those relationships), but they cannot be ‘corralled in’ as if they were ‘horses on the farm’ of mathematics. Their uniqueness cannot be completely understood via equivalence classes alone. They are ubiquitous and therefore not algebraic. They are pre-nascent to number, equivalence classes, and validity claims and are therefore not rational. These are not the only reasons. It’s also about WHERE they are embedded in the knowledge substrate compared to the concept of number, set, category…. They lay more deeply embedded in that substrate. The reason why your question is so hard for mathematics to answer is, because our current mathematics is, as yet, unable to decide. We need to ‘see’ these problems with a more complete set of ‘optics’ that will yield them to mathematical scrutiny. This system is quite interesting if we allow ourselves to talk about the qualities of infinite sets as if we can know their character completely. The problem is, any discussion of an infinite set includes their definition which MAY NOT be the same as any characterisation which they may actually have. Also, and more importantly, interiority as well as exteriority are accessible without the use of this system. These ‘Hyperreals’ are an ontological approach to epistemology via characteristics/properties we cannot really know. There can be no both true and verifiable validity claim in this system. Which questions does Category Theory help us answer? Another chapter in my attempt to help break the ‘spell’ of the category theoretical ‘ontologicisation’ of our world. This may seem to many as a purely academic question, but we all need to realise that all of what we consider a modern way of thinking rests upon ‘mental technologies’ such as Category Theory. Academics are literally taking the ‘heart’ out of how our world is being defined! If we don’t pay attention, humanity will continue losing its way. Category theory is a wonderful and powerful tool; nevertheless category theory, with all of its utility, is purely ontological. It can masterfully answer questions such as ‘Who?’, ‘What?’, and ‘How?’. Answers to questions of this kind are implicitly supplied by us during our consumption of the utility afforded by category theory. We often are so beguiled by this power of categorical expression that we don’t realise that is we ourselves who bring the ‘missing elements’ to what it offers as an expression of knowledge. It does a wonderful job with exteriority (ontology), but cannot sufficiently describe nor comprehensively access interiority (epistemology). Therefore, it has limited metaphysical value with respect to philosophy in general. Philosophies of mind, of language, or of learning are not comprehensive using only category theoretical tools. Categorical structures are highly portable, but they can describe/express only part of what is there. There are structures, dynamics, and resonance that the ontology and functionalism in category theory completely turns a blind eye to. More general than category theory is knowledge representation. It includes and surpasses category theory in many areas, both in scope and depth, but in particular: knowledge representation includes not just the ontological aspects of what we know, it goes further to describe the epistemological as well. The qualities of Truth, Goodness, Beauty, Clarity,… can be defined and identified within a knowledge representation if the representation is not restricted to ontology. When category theory is used for the purpose of defining qualia, the objects must first be ontologised and functionally reduced. Trying to grasp them with tools restricted to category theory (or even semiotics) is like grasping into thin air. Category theory, although very powerful, is no match for the challenge of a complete representation of knowledge. Category theory will tell you how to tie your shoes, but it can’t tell you why you are motivated to do so. First, allow me to rename theses numbers during the remainder of this post to lateral numbers, in accordance to the naming convention as was recommended by Gauss. I have a special reason for using this naming convention. It will later become apparent why I’ve done this. When we raise lateral numbers to higher powers, the answers do not get higher and higher in value like other numbers do. Instead, a pattern emerges after every 4th multiplication. This pattern never ceases. All other numbers, besides laterals, have a place on what currently is called the ‘Real number line’. I qualify the naming of the Real Numbers, because even their conceptualisation has come into question by some very incisive modern mathematicians. That is a very ‘volatile’ subject for conventional mathematicians and would take us off on a different tangent, so I’ll leave that idea for a different post. If we look for laterals on any conventional Real number line, we will never ‘locate’ them. They are found there, but we need to look at numbers differently in order to ‘see’ them. Lateral numbers solve one problem in particular: to find a number, which when multiplied by itself, yields another negative number. Lateral numbers ‘unify’ the number line with the algebraic pattern shown above. 2 is positive and, when multiplied by itself, yields a positive number. It maintains direction on the number line. When one of the numbers (leaving squaring briefly) being multiplied is negative, the multiplication yields a negative number. The direction ‘flips’ 180° into the opposite direction. Multiplying -2 by -2 brings us back to the positive direction, because of the change resulting in multiplying by a negative number, which always flips our direction on the number line. So, it appears as if there’s no way of landing on a negative number, right? We need a number that only rotates 90°, instead of the 180° when using negative numbers. This is where lateral numbers come into play. If we place another lateral axis perpendicular to our ‘Real’ number line, we obtain the desired fit of geometry with our algebra. When we multiply our ‘Real’ number 1 by i, we get i algebraically, which geometrically corresponds to a 90° rotation from 1 to i. Now, multiplying by i again results in i squared, which is -1. This additional 90° rotation equals the customary 180° rotation when multiplying by -1 (above). We may even look at this point as if we were viewing it down a perpendicular axis of the origin itself (moving in towards the origin from our vantage point, through the origin, and then out the back of our screen). [If we allow this interpretation, we can identify the ‘spin’ of a point around the axis of its own origin! The amount of spin is determined by how much the point moves laterally in terms of i. The cycle repeats itself on every 4th power of i. Seeing numbers in this fashion makes a point n-dimensional. Does Division By Zero Have Meaning? Yes, in knowledge representation, the answer is the interior of a holon. Ontologies go ‘out of scope’ when entering interiority. The common ontological representation via mathematical expression is 1/0. When we ‘leave’ the exterior ontology of current mathematics by replacing number with relation, we enter the realm of interiority. In the interior of relation, we access the epistemological aspects of any relation. In vortex mathematics 1/0 is known as ‘entering the vortex’. 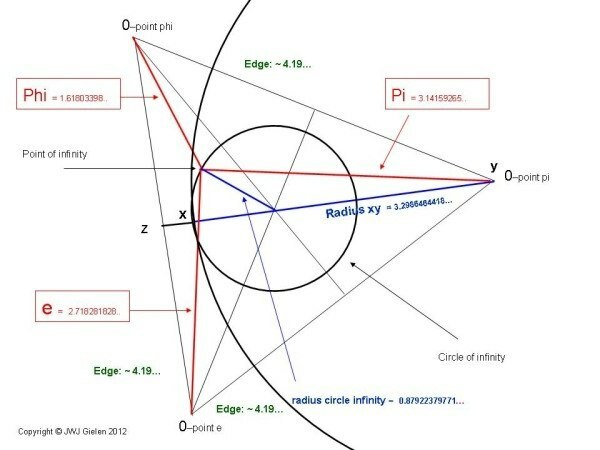 There are other connections to some new developments in mathematics involving what is called ‘inversive geometry’. If we think of say… the point [x, y, z] in space, we may assign x, y, and z any number value except where one of these coordinates gets involved in division where 0 is not allowed (up to this point in common mathematics) as a denominator. x/z is not allowed when z=0, for example. Now, if we are dealing with interiority, numbers are replaced by relationships, such as [father, loves, son]. What if the son has died? Is the relationship still valid? The answer to this question lies within the interior of those involved in the relation. Are sets, in an abstract sense, one of the most fundamental objects in contemporary mathematics? The equivalence relation lies deeper within the knowledge representation and it’s foundation. There are other knowledge prerequisites which lie even deeper within the knowledge substrate than the equivalence relation. The concepts of a boundary, of quantity, membership, reflexivity, symmetry, transitivity, and relation are some examples. They are wonderful tools to explain much of our world, but lack ‘The Right Stuff’ to handle the metaphysical underpinnings of anything near a Philosophy of Mind, Philosophy of Language , or a Philosophy of Learning. This is, because Category Theory specialises on roughly half of the Noosphere. It does a wonderful job on exteriority, but cannot sufficiently describe nor comprehensively access interiority. Therefore, as is the case with Semiotics, has limited metaphysical value with respect to philosophy in general. For example: philosophies of mind, language, or learning are not possible using only category theoretical tools and/or semiotics. I want to also comment on Figure 3 (which also exposes missing or false premises in the paper), but I will wait until I have discussed the assertions in the quote above which the authors of this paper reference, accept, and wish to justify/confirm. 1) The purpose of a representation is NOT to gain knowledge; rather, to express knowledge. Also, truth has nothing to do with knowledge except when that value is imposed upon it for some purpose. Truth value is a value that knowledge may or not ‘attend’ (participate in). 1a) The ‘truth value’ of the System (‘system’ is a false paradigm [later, perhaps] and a term that I also vehemently disagree with) does not always enter into the ‘dialogue’ between any knowledge that is represented and the observer interpreting that knowledge. 2) The interpretation of a representation is not to “deduce correct conclusions”; rather, to understand the meaning (semantics and epistemology) of what is represented. ‘Correct’ understanding is not exclusive to understanding nor is it necessary or sufficient for understanding a representation, because that understanding finds expression in the observer. 2a) ‘Correct’, as used in this paragraph, is coming from the outside (via the choice of which data [see Fig. 3] is represented to the observer) and may have no correspondence (hence may never ever commute) whatever to what that term means for the observer. The authors are only talking about ontologies. That is a contrived and provincial look at the subject they are supposing to examine. There may (and usually are) artefacts inherent in any collection and collation of data. The observer is forced to make ‘right’ (‘correct’) conclusions from that data which those who collected it have ‘seeded’ (tainted) with their own volition. ‘System’ (systematising) anything is Reductionism. This disqualifies the procedure at its outset. They are proving essentially that manipulation leads to a ‘correct’ (their chosen version) representation of a ‘truth’ value. I could tie my shoelaces into some kind of knot and think it were a ‘correct’ way to do so if the arrows indicate this. This is why paying too much attention to a navigation system can have one finding themselves at the bottom of a river! The paper contains assumptions that are overlooked and terms that are never adequately defined! How can you name variables without defining their meaning? They then serve no purpose and must be removed from domain of discourse. Categorical structures are highly portable, but they can describe/express only part of what is there. There are structure, dynamics, and resonance that ontology and functionalism completely turns a blind eye to. The qualities of Truth, Goodness, Beauty, Clarity,… (even Falsehood, Badness, Ugliness, Obscurity,…) can be defined and identified within a knowledge representation if the representation is not restricted to ontology alone. In order to express these qualities in semiotics and category theory, they must first be ontologised funtionally (reduced). Trying to grasp them with tools restricted to semiotics and category theory is like grasping into thin air. That is actually the point I’m trying to make. Category Theory, and even Semiotics, each have their utility, but they are no match for the challenge of a complete representation of knowledge. The closer awareness is in some way to an entity, the more depth and the less scope it discerns. The farther awareness is in some way to an entity, the more scope and the less depth it discerns.